ADI’s ‘Is that fur real?’ card is available to faux-friendly fashionistas who want to alert designers, retailers and shoppers of the pain behind products featuring real fur. The pocket-sized resource, designed to fit inside a purse or wallet, features a young fox (pictured) – one of the millions of animals farmed for fur each year. The fur industry has redoubled its efforts to allay consciences and hide the hideous suffering of animals farmed for fur by promoting so-called “ethical” certification schemes. However, conditions are little different for the animals, as revealed during ADI’s investigation of 30 fur farms across Finland, many of which were certified by the Finnish government. We documented widespread animal suffering and neglect, including animals with open and infected wounds and obvious signs of untreated infection; eyes infected or missing; tails that had been bitten off; deformed and damaged legs; overgrowing gum disease making it difficult for them to eat or drink. The cages and facilities were also found to be dilapidated and dangerous. More than 100 million animals are killed around the world each year for their fur. Most animals will be farmed in factory conditions but others will be trapped in the wild, caught in indiscriminate snares or traps. A whole host of animals are killed for their fur including mink, foxes, rabbits, sables, chinchillas, beavers, lynx, seals, raccoons, coyotes, muskrats, wolves, otters, cats and dogs. 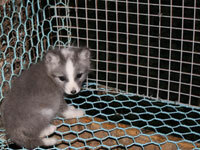 Fashion should be fun which everyone can enjoy, but designers showcasing fur are bringing misery to the catwalk. With fantastic faux alternatives, there is never a need to make animals the victims of fashion. Join us in calling for fur always to be fake and never leave home without our handy new resource. Email info@ad-international.org to order our ‘Is that fur real?’ cards today!